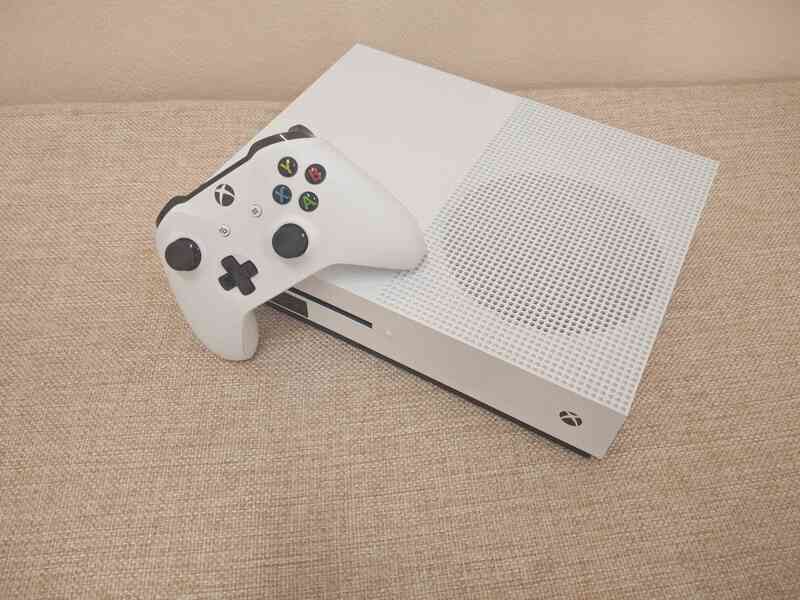 In 2016 Microsoft has presented an updated version of their console under the name of Xbox One S. An updated station offers us a smaller size, new hardware, UHD Blu-Ray support. There also is HDR support and HDMI 2.0a. Consoles will be sold in 500Gb, 1Tb and 2Tb variations. 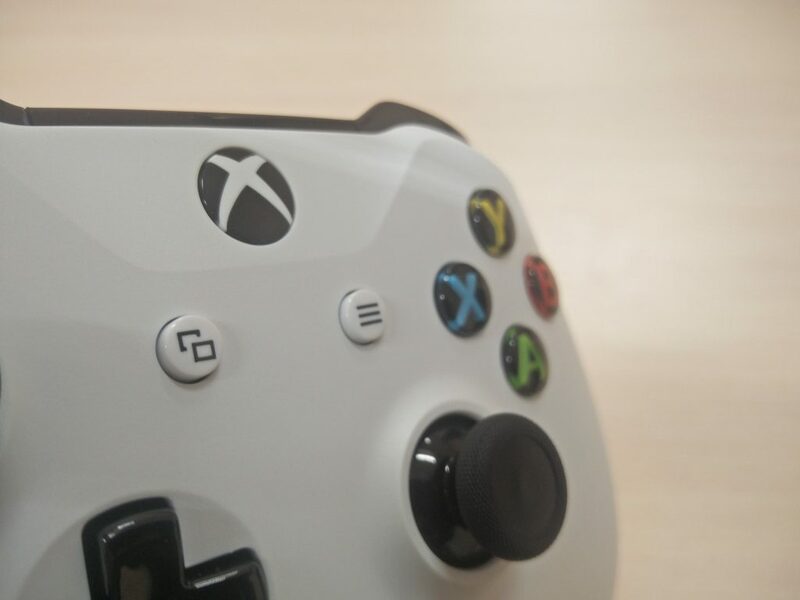 Together with it, we have a gamepad customization service, which allows customers to color each detail of the gamepad. 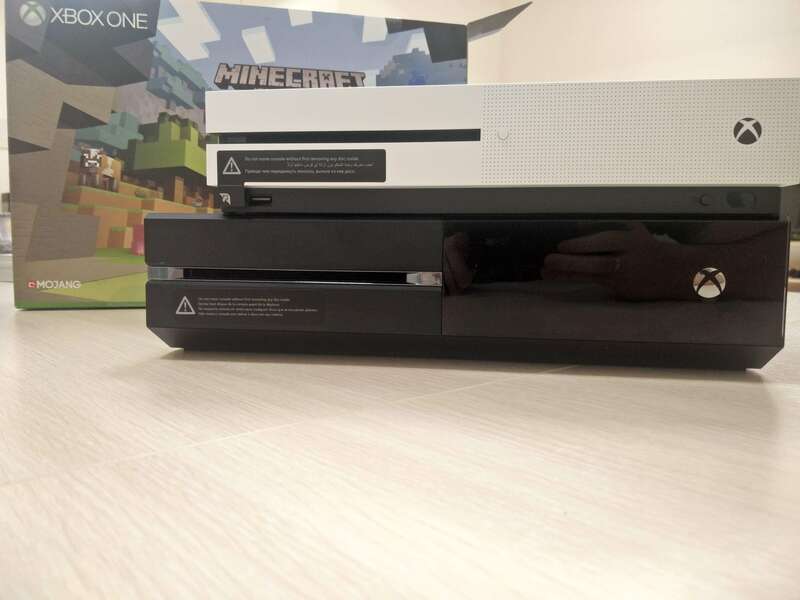 With this bonus comes a detachable vertical stand for the Microsoft console. Another noticable fact is the ability the power block inside the console, which finally gets rid of these few more wires. The system perfomance has increased up to 6 teraflops, which allows us to see 4K resolution, HDR picture and VR applications. 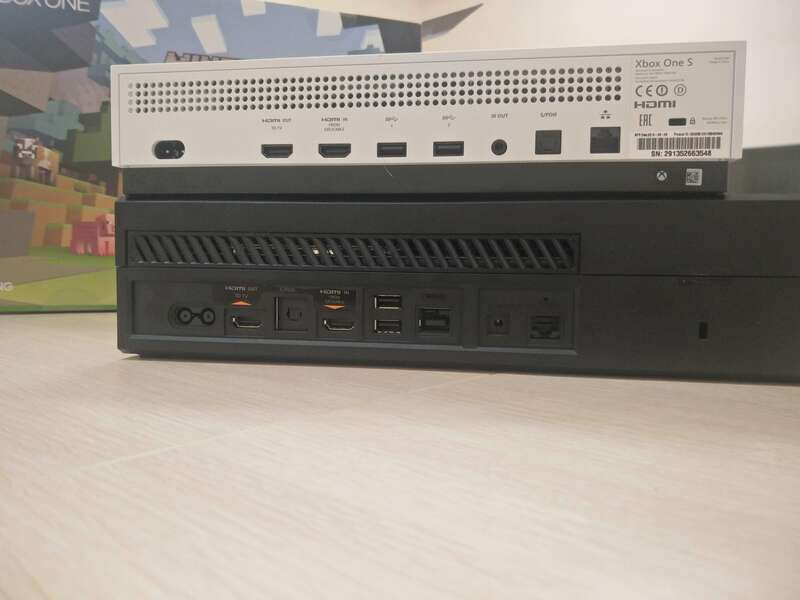 Comparing to the elder brother, the console got thinner in all sizes, width, length and height.There are glancing surfaces no more. Black stribe below can catch an eye, but it can be called rather a pleasant addition to “black and white suit” of the console, rather than a design mistake. The cons here would be upper fan holes, that get into eyes right away at first look. Now to launching the console. The first launch is usual: language, geoposition, network connection. Pictures of the original Xbox One may kill the feeling of the fact that we purchased a new console, but everything changes after an update. Suddenly, Xbox offers us to update our gamepad software, which is quite strange. The only noticable change for us was a background picture. 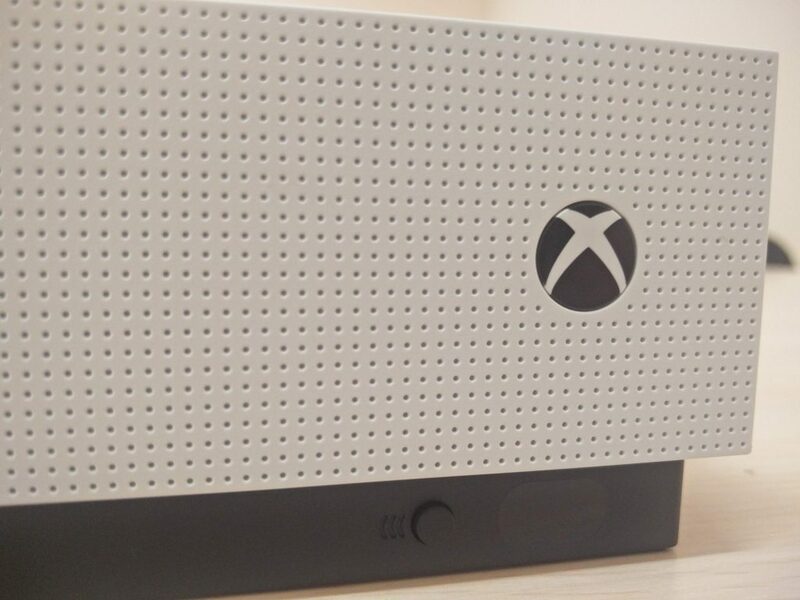 Games that were bought for the oroginal Xbox One are fully compatible with the new version. Games, that don’t have a 4K support will customise the picture, according to the screen resolution. Noteworthy the fact that current console version refused from Kinnect, even though there is an opportunity to connect it through the adapter, which will take one of the USB ports. There even is a place for Cortana, who helps us to browse the Internet. It’s strange, but we haven’t found the voice dial. Perhaps, it will be added in further updates. We were promised to have 4K so it had to be checked, of course. And here we faced another problem. UHD resolution works only with TV with 60 Ghz frequency. There will be 4K but with fewer games or with lesser frequencies. The console now works smoother, faster in switching between apps. Flash and HTML5 support are a good addition too. We tried a browser game and everything worked just fine. 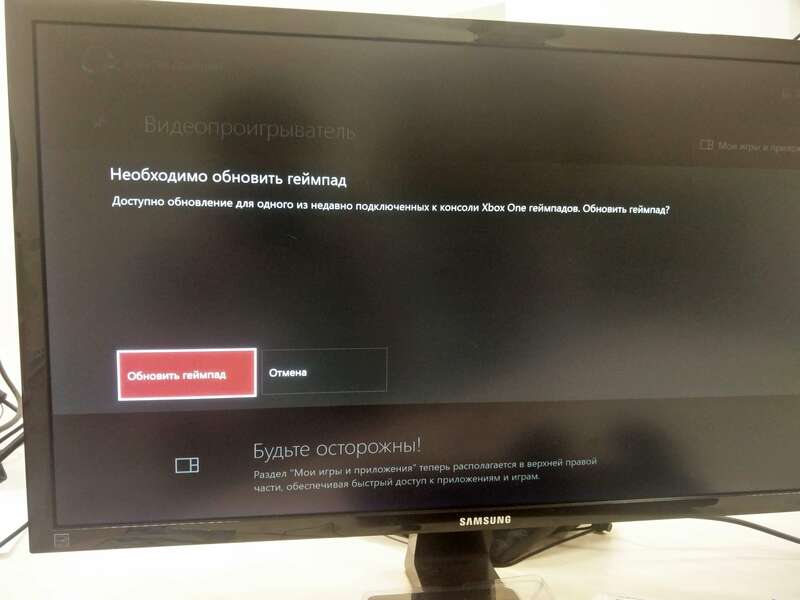 We can also play games withouth having to download them completely. 60% would be enough to start playing. First of all, we tried Batllefield 1, of course. The feelings will be shared a bit later and with more details, but we have something to say already. During game launching and the intro we can see a small transition to high definition.These metamorphoses create a pleasant taste of a game on a new level. The world is increadibly detalized. Many hours of playing didn’t cause any lags or freezes or anything on the console side. FPS is stable even during transitions from calm places to battlefield with horses, infantry, tanks and everything. Long story short, the new Microsoft console deserves credits. Works fast, smooth and silent. Xbox One S completely justified the expectations. 4K is in full duty, the console works well. HDR and VR (with Oculus Rift) is a great addition. Many Bundles can be a reason to buy a new Xbox for a great amount of people. If you are not the one, whose breath is taken by words like PS4 exclusive, think about Xbox One, really. Although, if you already have the original Xbox One, better wait for Xbox Scorpio. Who knows what they have in their pockets in order to surprise us?